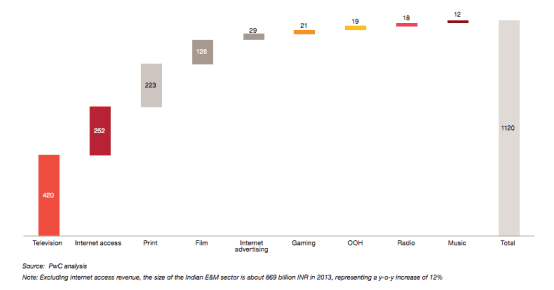 Looking at the growth trajectory of media and entertainment section, PWC did a research to find out the future prospects related with it. The report titled India Entertainment & Media Outlook 2014, released by them, revealed that media and entertainment sector in India is expected to grow steadily at a CAGR of 15% and that it is most likely to exceed Rs. 227,000 crore by 2018. If you look back, you will find that users have paid Rs 25,200 Crore to access the internet in 2013 and 17,100 Crore in 2012. Moreover, the print medium earned the Rs 22,300 Crore in 2013 in subscription and advertising, which is higher as compared to what it was in 2012 i.e. 21,000 Crore. The main factor that contributes to this growth in internet usage is the increased adoption of Smartphones and their usage as the primary medium for internet connectivity. Besides, Android usage had left behind Desktop usage in India. The report also reveals that the of internet access to the total revenue of the media & entertainment industry has gone up from 18 per cent in 2012 to 22 per cent in 2013, while that of the print medium fell from 22 per cent in 2012 to 20 per cent in 2013. In compare to west, the shift of advertising online is a bit gradual in India. For instance, revenue from digital advertising surpassed that of print advertising long ago and is now closing in on television in the US. Facts and Stats that matter! • Revenue growth is being driven by Internet access rather than content spending. • Two-thirds of revenue growth from consumers and advertising will be digital. • Advertising revenue is expected to around Rs. 60,000 Crore by 2018.